Fix: for VERY slow WiFi in Windows 10 | Really useful stuff that I bump into….. Unfortunately, this did nothing for VERY slow network speed. Still searching for answers. Is this VERY slow network speed in Windows 10? If so, was the same PC fine running Windows 7 or 8? This is insane!! 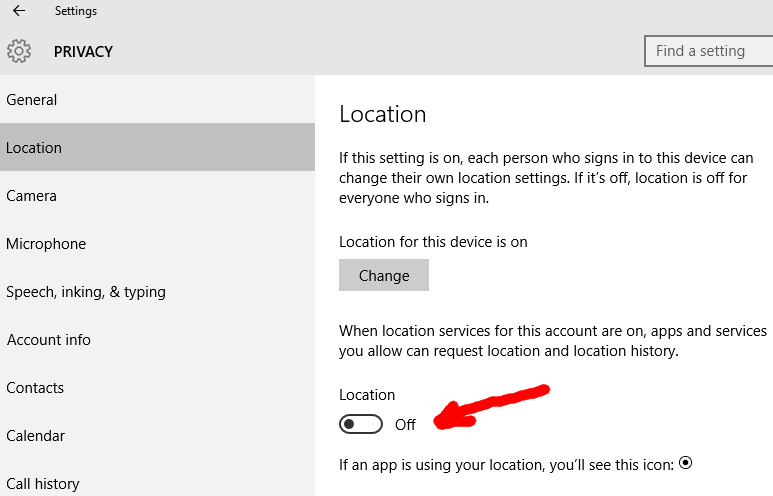 Toggling the location as you said from off to on or on to off fixes the problem entirely.. Cannot believe they have not patched this! Sorry that I missed your comment – and good news that this worked for you!! this really worked. But I inverstigated further; I have changed blutooth driver to windows 10 generic blutooth driver fixed this wlan issue. Excellent news – and a top tip about returning to W10 generic BT drivers! Running clean install of Windows 10 1607 and this trick fixed my slow WiFi internet!, Thank you so much!. You are very welcome – glad I was of some help! I am not quite sure what you mean by “generic drivers” and if I did, why you would want to change to them? In the main, Windows (7, 8, 8.1 and 10) should install the correct drivers for any device automatically – but remember, that Microsoft engineers are not magic. i.e. they can only provide the drivers as provided by the relevant hardware manufacturer – and as confirmed by that manufacturer to be correct. This explains why sometimes Windows updates a driver to one that doesn’t work – well, it’s because the hardware vendor gave it to Microsoft and asked them to roll it out as the correct update OR, those cases where you can download later/better drivers direct from the hardware vendors site – because the hardware vendor hasn’t given them to Microsoft to distribute yet. This worked for me, THANKS!!!! Thanks, I was going nuts why is the wireless speed is so slow.